Churchill earned champion trainer Aidan O'Brien his 20th Group One winner of 2016 with a narrow victory in the Dubai Dewhurst Stakes at Newmarket. The 8/11 favourite was held up in mid-division in the early stages under Ryan Moore as his stablemate and 66/1 outsider Lancaster Bomber cut out the early gallop hard on the stands' rail. Two furlongs out, the field fanned across the course to try and throw down their challenge and Moore briefly had to work, with the strong-travelling Blue Point on the outside and Thunder Snow also ready to get involved. But Churchill answered his jockey's call, as he has kept doing this season, made some space and went on to score with something in hand, Lancaster Bomber rallying back past rivals for second place - the second day running that O'Brien had bagged a one-two in a juvenile Group One. Moore said: "He was always going to win. He's a very, very good colt. It wasn't as evenly-run as it should have been, but this lad has got an awful lot in his favour. "There's not a lot he can't do. When I ask him, he always finds. He's definitely a Guineas horse. I think he'll get better." 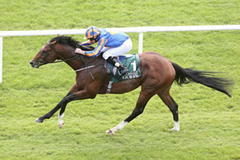 O'Brien, bagging his 20th worldwide Group One Flat race of the year, was winning the Dewhurst for the fifth time. He said: "They went a sensible pace. He settled in there and quickened down into the dip. "It got a little bit messy after the two [furlong marker] but Ryan guided him through and produced him lovely, so we're over the moon. "Physically he's a very imposing horse. He's probably a more imposing two-year-old than we've ever trained. "He has a great mind and relaxes and sleeps. He just does the minimum, which is brilliant. He's a great traveller and the qualities are there in abundance. "Anyone that has had anything to do with him gets that special feeling from him - that's very special when that happens. "We've always viewed him as a miler, but that's not to say he won't get further. He's so relaxed and laid-back and when he came in (to the winner's enclosure) he wasn't even blowing. He's very economical as a galloper - he saves everything." Sky Bet cut the winner from 5/2 to 6/4 for next year's QIPCO 2000 Guineas, with spokesman Michael Shinners saying: "The Dewhurst looked the best two-year-old race run this season and we've been forced to go 6/4 Churchill to win the Guineas after once again showing guts to match his class on the Rowley Mile." Blue Point (8/1) now looks set to be aimed towards next year's Commonwealth Cup after looking a transparent non-stayer here over seven furlongs. His trainer Charlie Appleby said: "I'm delighted with the run and he lost nothing in defeat. He's answered the question now and it will be the Commonwealth Cup next year. "That's what we'll do and he'll probably have one or two outings beforehand, the Sandy Lane Stakes probably and then on to the Commonwealth Cup. "William [Buick, jockey] said he learnt a lot today and settled and picked up nicely before the last 100 yards when the petrol ran out. It was a good performance and he'll be a nice horse for next year." Saeed bin Suroor saddled fourth-placed Thunder Snow (16/1), also for Godolphin, and he said: "The horse ran well and is in good form. He's done well and I'm happy with him. "He's been second in two Group 2 races and now ran well in fourth in a Group 1. There is no plan and we'll see what the options are - I don't know if he'll run again this year and we'll see in a few days."